How does the MicMuff® Microphone Cover work in my noisy airplane? The MicMuff Microphone Cover is a two-part device. The first part is a foam sleeve placed over the mic. You probably have something similar on your microphone now. These sleeves are frequently referred to as “wind screens”. The wind screen reference is a tad bit misleading since wind blows right through them. Wind screens—as they are called—are often used to reduce vocal plosives or popping sounds from consonants such as “P”, “B”, et cetera when speaking into the microphone. Oregon Aero uses the foam to create an acoustic chamber surrounding the mic. 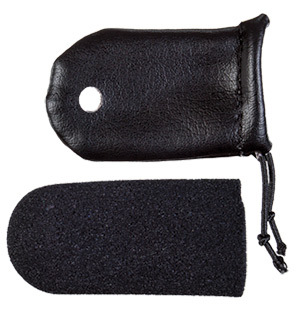 The second component of our MicMuff Microphone Cover is a soft synthetic leather sleeve with two small holes and an elastic cord to fasten over the microphone. The sleeve is pulled over the foam and the two small holes are aligned with the front and back sound ports on the microphone. This chamber, or acoustic baffle, formed around the microphone limits the amount of cockpit noise that can enter the microphone. The noise level inside the microphone drops below 97 dB, allowing the noise canceling microphone to do the job it was intended to do. How will my voice go through the tiny hole in the MicMuff Microphone Cover? Easily! The opening is not small enough to restrict close range voice. Look at the microphone opening on your cell phone, it is often smaller than the head of a pin. Will I need more than one MicMuff® Microphone Cover if I have more than one headset or helmet? If they are used at the same time, yes. Many intercom systems keep all of the connected headset microphones live at the same time. If there is a microphone without a MicMuff Cover connected to the system, it will generate unwanted noise. And that noise will be introduced into the rest of the system. Imagine a boat with five holes in the bottom. Lucky for us, three of these holes have plugs in them. However, we still get that sinking feeling because the remaining two holes are allowing unwanted water into the boat. If you only plug one of the open holes, the boat will continue to sink—not as fast, but we are still taking in unwanted water. In order to keep unwanted water from filling the boat, all holes must be plugged. To keep the most noise out of your intercom system, make sure every microphone has the MicMuff Microphone Cover installed. Will the MicMuff® Microphone Cover fit all microphones? Oregon Aero offers MicMuff microphone covers that are effective on M-87 Military, Electret, and Dynamic Microphones. If you are not sure which MicMuff cover is right for your aviation headset or helmet, give us a call at 800-888-6910. A noise-canceling microphone has two sound ports in which sound can enter. These sound ports oppose one another—one on the front, the other on the rear. On the inside of the microphone cartridge—between the two sound ports—is a diaphragm which is sensitive to sound waves. In flight, the cockpit is flooded with noise from the engine, prop, wind, the roar of that passing jet, et cetera... Because these sources of cockpit noise are not directly in front of the microphone, background noise enters both microphone ports at the same level. Thus, the noise produces even pressure on both sides of the diaphragm causing it to remain stationary. The background noise effectively cancels itself out. When you speak into the microphone, your voice is directed to only one of the microphone ports. Your voice generates more sound pressure on one side of the diaphragm than the other. The difference in sound pressure causes the diaphragm to resonate and generate an electrical waveform of your voice minus the cockpit noise. Pretty nifty, eh? This technology has been around for a long time and works well until the ambient noise level exceeds 97dB of sound pressure. This level is easily be exceeded by larger aircraft engines—think warbird. Other factors contributing to high levels of cockpit noise are insufficient sound insulation, open doors/windows/vents, or flying an open cockpit plane. When the cockpit noise entering the microphone exceeds 97dB, it causes the membrane to resonate harmonically to the cockpit noise. This resonation generates a noise that sounds like the shhhhhh of wind. Unfortunately, when the mic resonates three bad things happen. One, the microphone fails to cancel cockpit noise. Two, the noise gets transmitted through your radio or intercom transmissions. And three, the high noise-to-signal ratio causes your voice to be unintelligible. Your voice becomes lost in the chaos.